A Singer/Songwriter in the vein of early 1970's pop rock. Vaguelyreminiscent of artists like The Dooby Bros, Cat Stevens and Crosby, Stills & Nash…but with a bit of Marc Cohn thrown in, giving him a more modern edge. include Kenny Loggins, Bruce Springsteen, Shawn Colvin, John Haitt, Garth Brooks, Paul Carrack . Ken Klar has spent the last ten years honing a craft that he first felt in his early teens. He began life as a drummer and lead vocalist in a number of cover bands from Los Angeles to the California Central Coast area. While touring and writing during the nineties, he has finally come into his own voice. Now, fully prepared, he is assaulting the new millennium head on. "...I really believe the song (Am I The Only One Lonely Tonight) you sent me has GREAT POTENTIAL. I have been busy here in Austin putting together the Songwriters Building Block. It gives writers the opportunity to show material and meet other writers and focus on demoing their songs. We also have a featured writers segment with 4 writers in the round. If ever you come out this way we would love to have you as one of our featured writers. Take care, keep writing and change the world." 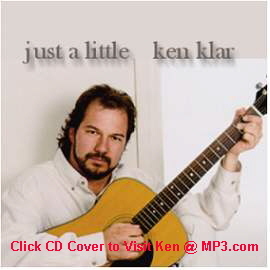 Ken Klar is a gifted musician, songwriter, and producer. From Broadway to Country he can write a song to fit any voice style. His professionalism follows through from the beginning to the end of the project, even if it's just a matter of giving advice. Whether you are a beginner or professional Ken is willing and able to help you succeed. Thank you for keeping true to yourself and others in such a superficial industry.